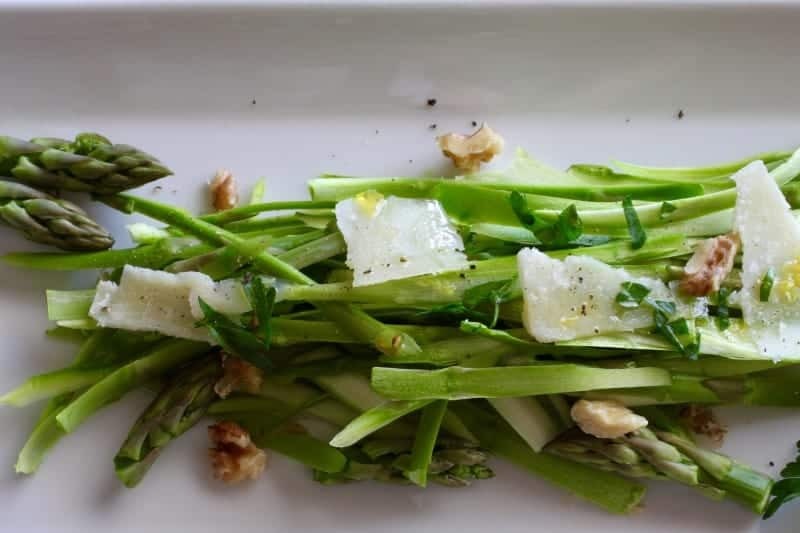 Asparagus walnut salad with lemon vinaigrette is shaved asparagus with fresh lemon, Parmesan and walnuts, packs spring flavor into every teeny, tiny bite. One of my best asparagus recipes + top 10 tools in my kitchen. My kitchen is valuable real estate. I limit my collection of gadgets because I don’t have much storage space. Multitasking equipment is what I want. I surveyed fellow dietitians who know their way around the kitchen and found some great ideas on how to use your tools over and over. 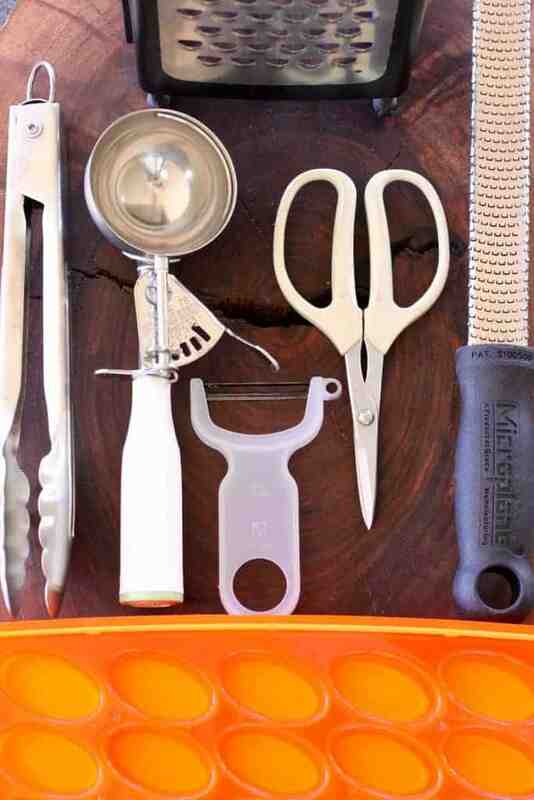 Here are the top ten multi-use tools used by dietitians who love to cook. Besides cheese, that grater shreds dry bread into crumbs and cold butter to make a biscuit or scone and “dot” pies. It’s also a stand to dry plastic bags. My grater is a Microplane box grater. I like the sharp holes, sturdy handles and feet. 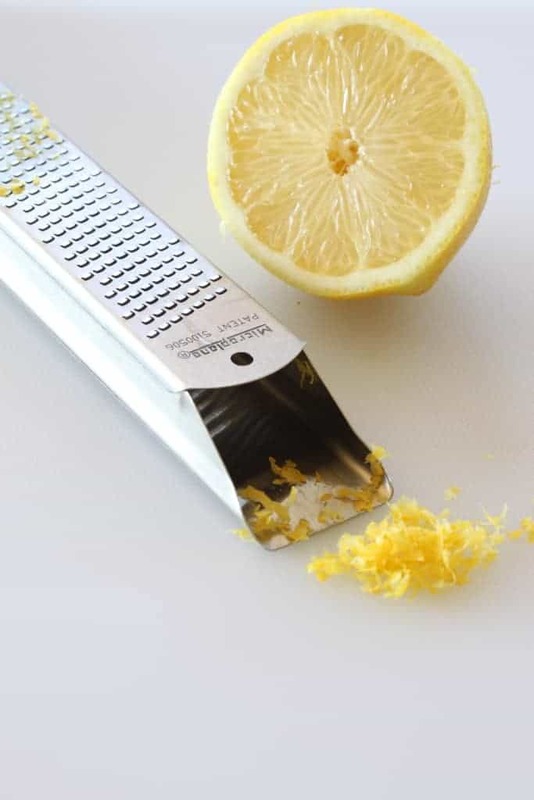 A Microplane zester not only grates fruit zest, but hard cheese, chocolate, nutmeg, ginger, garlic, and shallots. Vinaigrettes and dressing work best on dry salad greens, but don’t stop there Use your salad spinner to rinse fruit and herbs and to soak and drain rice noodles. I use an Oxo Soft Spinner. It sits firmly on the counter because of a non-slip ring on the bottom, it can go in the dishwasher and it’s quiet. Use your scoops to portion cookie dough, stuff shells, remove seeds from cantaloupe and measure dry ingredients such as sugar. A number 8 scoop is one-half cup and number 16 scoop is one-quarter cup. I like stability of this Vollrath plus the grip on the handle. Muffin tins assist with keeping cupcake decorations in order plus can be used to bake eggs. Add a drop of olive oil and an egg in each space. Sprinkle with salt and pepper. To snazz it up, mix in spinach or arugula, cheese or veggies. Bake at 350˚ for 7-10 minutes. These tins also provide portion control. Portion cooked oatmeal into muffin tin. Freeze. Remove portions and microwave 1-2 minutes. These Anolon nonstick muffin tins are heavy so less likely to warp. That means you won’t replace them often, so you’re saving money in the long term! Because they are dark, they absorb more heat, so baking times may be shorter. Metal tongs ream fruit for a quick squirt of juice, toss a salad, rotate hot dishes in the oven and retrieve corn or potatoes that are boiling in water. Oxo makes tongs that are good to use with non-stick cookware plus varieties with stainless steel tips. The locking heads keeps them neat in the drawer. Use kitchen shears cut string to truss a chicken, plus can be used to trim fat from meat, cut pizza into slices, chop cooked chicken, and snip herbs. I seem to always be reaching for my Joyce Chen scissors to open a bag, cut herbs, or trim parchment paper. They are sharp with comfortable handles. Vegetable peelers cut thin slices of asparagus, cucumber, zucchini, carrot, cheese, and shave coconut. Kuhn Rikon is my favorite. Use extra ice cube trays to freeze leftover broth, juice, pesto, egg whites, and cooked spinach. Herbs such as basil, oregano, and parsley can be frozen. Clean, chop and pack herbs in ice cube tray. Cover with a neutral oil such as canola oil and freeze. Once frozen, transfer to freezer bags and use when you want to add a boost of flavor. I like the flexibility of these Mastrad trays. A cutting board that goes in the dishwasher helps keeps the kitchen safe. One that doesn’t slip all over the counter keeps it even safer. I have several Oxo cutting boards and especially like the hand grips that keep it in place. Now let’s put all these useful tools to work. Juice and zest the lemon, peel the asparagus, and snip the herbs. Shaved salads are a simple way to use vegetables. Thinly slice vegetables using a vegetable peeler and toss them in a vinaigrette. 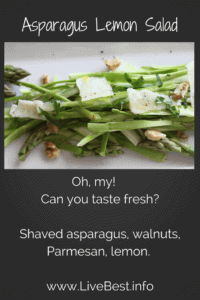 This shaved asparagus salad highlights asparagus, a vegetable that is now in season. 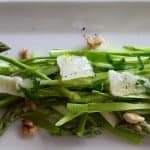 Asparagus walnut salad with lemon vinaigrette is shaved asparagus with fresh lemon, Parmesan and walnuts, packs spring flavor into every teeny, tiny bite. In a small bowl, whisk together olive oil, lemon zest, lemon juice, salt and pepper, set aside. 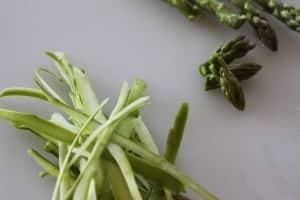 Break or cut off the woody bottoms from the asparagus spears; discard. Break or cut off the flower ends and set aside. Use a vegetable peeler to shave the asparagus stalk. When it gets too thin to peel, chop the remaining spears with a knife.